Mesoderm originated fibroblast cells can be reprogrammed to ectodermal induced neuronal (iN) cells by the overexpression of proneural transcription factor (TF) Ascl1 (Chanda et al., 2014; Vierbuchen et al., 2010). Co-expression of Brn2 and Mytl1 with Ascl1 (BAM), enhances reprogramming efficiency by suppressing a competing myogenic program (Chanda et al., 2014; Treutlein et al., 2016). During reprogramming, Ascl1 acts as a pioneer factor by binding to and opening closed chromatin regions, as well as modulating the binding of Brn2 (Wapinski et al., 2013), while Myt1l serves as multi-lineage repressor that maintains neuronal identity (Mall et al., 2017). The accumulation of abundant mCH is an epigenomic hallmark unique for mature neurons of mammalian brains, which could not be experimentally induced so far (Guo et al., 2014; Lister et al., 2013). mCH is recognized by MECP2 and serves critical gene regulatory functions in mature neurons (Chen et al., 2015; Gabel et al., 2015; Guo et al., 2014; Stroud et al., 2017). The reprogramming of fibroblasts to neurons using Ascl1 alone or in combination with Brn2 and Myt1l is a powerful way to interrogate the biochemical function of these TFs and given their prominent role during neural differentiation will also help dissecting their potential regulation of mC remodeling during neuron differentiation. Moreover, the role of DNA methylation in experimental induction of the neuronal lineage by TF reprogramming is not known yet and we currently lack a deep characterization of mC landscape of iN cells. Here we analyzed mC reconfiguration during iN cell reprogramming using whole-genome base-resolution methylome sequencing (MethylC-seq) and functionally perturbed methylation dynamics by genetic inhibition of Dnmt3a. Base-resolution methylomes were generated for iN cells induced by either Ascl1 alone or all three TFs (BAM) in mouse embryonic fibroblasts (MEFs, Supplementary file 1). We analyzed the methylomes of control MEFs, cells at initial (Ascl1 2d) and intermediate stages of reprogramming (Ascl1 5d and BAM 5d) and fully reprogrammed iN cells (Ascl1 22d and BAM 22d). 5d and 22d cells were isolated by fluorescence-activated cell sorting (FACS) using a neuronal TauEGFP reporter. We further generated methylomes for in vitro differentiation of neural progenitor cells (NPC, NPC 7d, NPC 14d and NPC 21d) under comparable culturing conditions. 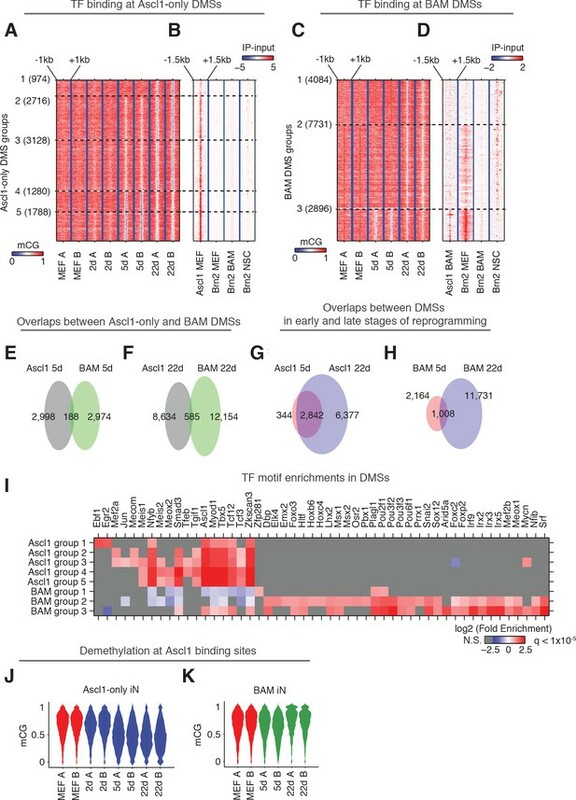 Remarkably, Ascl1 or BAM induced significant global accumulation of the neuronal-enriched non-conventional mCH methylation (Figure 1A). mCH level reached an average of 0.28% in Ascl1 22d iN cells and a much greater level (0.57%) in BAM 22d iN cells, which is comparable to the frontal cortex tissue of 2 week old mice (Lister et al., 2013). In mature mouse cortical neurons (NeuN+), mCH is strongly enriched in the CAC context and mCAC accounted for approximately 34% of all mCH in mature neurons (Figure 1—figure supplement 1A). Similarly, we found neuronal reprogramming from fibroblasts was associated with a progressive establishment of mCAC predominance. In fully reprogrammed Ascl1 or BAM 22d iN cells, mCAC became the most abundant form (26% to 27%) of mCH (Figure 1—figure supplement 1A). mCH is inversely correlated with gene expression in mature neurons (Guo et al., 2014; Lister et al., 2013). mCH was very weakly correlated to gene expression in MEFs or in intermediate reprogramming stages (BAM 5d) but became strongly inversely correlated with gene expression in BAM 22d cells suggesting a similar role of mCH in the brain and iN cells (Spearman r = −0.479, p-value<2.2×10−308, Figure 1—figure supplement 1B). The accumulation of mCH in iN cells was correlated with a significant elevation of genome-wide mCG level from 72.7% in MEF to 79.5% in Ascl1 22d cells, and 82.5% in BAM 22d cells (Figure 1A). The Ascl1, Brn2 and Myt1l reprogramming factors induce an authentic, neuron-specific CH methylation pattern in fibroblasts. (A) Global mCG (top panel) and mCH (bottom panel) levels of iN cells and NPC-derived cells. mCG and mCH accumulates in both maturing iN cells and differentiating NPCs. (B) Correlation of gene body mCH levels of iN cell reprogramming samples, NPC derived cells, neural and non-neural tissues. Mature cortical neurons clustered more closely to BAM 22d than Ascl1 22d iN cells. NeuN +and NeuN- indicate neuronal and glial nuclei separated using anti-NeuN antibody, respectively (Lister et al., 2013). Exc indicates purified nuclei from excitatory neuron expressing Camk2a+ (Mo et al., 2015). (C) Left panel - K-means clustering of gene body mCH normalized to flanking regions (100 kb surrounding the gene). Reprogramming with BAM produces a global mCH profile more similar to cortical neurons compared to Ascl1 alone. TSS - Transcription Start Site. TES - Transcription End Site. (D) Global mCH level of samples compared in (C). (E) Relative expression (Z-score) of bulk RNA-seq analysis of iN cell reprogramming. Gene expression is inversely correlated to gene body mCH. (F–G) mCH pattern at genes with neuronal (F) and myogenic functions (G) in Ascl1 22d and BAM 22d iN cells. BAM 22d cells show greater depletion of mCH at synaptic genes and accumulation of mCH at myogenic genes, suggesting more efficient activation of neuronal genes and suppression of the alternate myogenic program compare to Ascl1 22d. To evaluate whether iN cells recapitulate the mCH landscape of primary neurons in the brain, we compared iN cells to NPC-derived neurons of various times in culture, mature neurons freshly isolated from the brain, different brain regions as well as non-neural tissues with significant levels of mCH accumulation (global mCH/CH >= 0.1, Figure 1B) (Hon et al., 2013; Shen et al., 2012). Using hierarchical clustering of gene body mCH levels, we found that gene body mCH in mature cortical neurons (Exc, NeuN +and Cortex samples in Figure 1B) was more strongly correlated with BAM 22d cells (box 1) than with Ascl1 22d cells (box 2) reflecting the more mature state of BAM iN cells compared to Ascl1-iN cells (Treutlein et al., 2016). Accordingly, Ascl1 22d cells correlated more strongly to early reprogramming stages (Ascl1 5d and BAM 5d) and non-neural tissues (box 3,4 in Figure 1B). Thus, as observed for gene expression patterns, BAM iN cells displayed a mCH landscape that is more similar to mature cortical neurons (Treutlein et al., 2016; Wapinski et al., 2013). We identified genes showing similar or distinct mCH patterns between iN cells and mature neurons using K-means clustering (Figure 1C and D; Figure 1—figure supplement 1C). We identified a large number (2,098, Cluster 15 and 16) of genes that were strongly depleted of mCH in BAM 22d iN cells but showed medium levels of mCH in immature iN cells and Ascl1 22d iN cells (box in Figure 1C). Notably, BAM 22d iN cells and matured cortical neurons showed similar hypo mCH for genes in Cluster 15 and 16. Through correlating with transcriptome analysis of iN cell reprogramming, we found that genes in Cluster 15 and 16 were actively expressed in successfully reprogrammed iN cells (Figure 1E and Figure 1—figure supplement 1D) (Treutlein et al., 2016). Cluster 15 was enriched in gene functions such as synapse and metal ion binding (Supplementary file 2). For example, Nrxn1 and Syt1 were depleted of mCH in BAM 22d cells but were enriched of mCH in Ascl1 22d cells (Figure 1F). We also found myocyte marker genes Tpm2 and Acta1 in Cluster 20, which shows greater level of mCH in BAM 22d iN than Ascl1 22d iN cells (Figure 1G). This is consistent with our previous finding that Brn2 and Myt1l can suppress the cryptic myogenic program in iN cell reprogramming induced by Ascl1 (Treutlein et al., 2016). In summary, we found direct reprogramming using BAM factors produces a global mCH pattern more similar to cortical neurons, compared to using Ascl1 alone. mCH pattern in BAM iN cells is more permissive for the expression of neuronal and synaptic genes, and more repressive for the expression of the competing myogenic program. Lastly, we examined the pattern of mCH at long genes in iN cells. It was recently found that long genes are associated with greater levels of mCH in the mouse brain (Gabel et al., 2015). Comparing fully programmed iN cells to mouse cortex we found a less pronounced increase in mCH level associated with gene length in iN cells (Figure 1—figure supplement 1E and F). To explore the role of mCH in regulating dynamic gene expression during reprogramming, we ranked genes by gene body mCH levels at an early stage of reprogramming (BAM 5d, Figure 2A–C). Genes showing early mCH accumulation were strongly enriched in downregulated genes (compared to MEF) in BAM 22d iN cells, and to a less extent enriched in both upregulated and downregulated genes in BAM 13d iN cells (Figure 2B and C). Thus early mCH accumulation is correlated with genes showing dynamic expression during reprogramming, and most strikingly with genes repressed in matured iN cells (BAM 22d). We identified up- and down- regulated and static genes during reprogramming by comparing BAM 22d iN cells to MEF, and analyzed mCH accumulation for each gene category across a range of gene expression levels (average expression across reprogramming) (Figure 2D and E, Figure 2—figure supplement 1A and B). In all expression levels and reprogramming stages examined, downregulated genes accumulated greater levels of mCH than genes with static or increased expression during reprogramming. Surprisingly, we found different patterns depending on the gene expression levels: lowly expressed genes accumulated high levels of mCH regardless of their developmental dynamics (Figure 2D; Figure 2—figure supplement 1A), whereas for actively expressed genes, gain of mCH is specific to developmentally downregulated genes; the mCH levels of upregulated and static genes were close to the MEF baseline (Figure 2E and Figure 2—figure supplement 1B). These results suggest a model that mCH is preferentially targeted to two main gene groups - constitutively repressed genes and actively expressed genes showing developmental downregulation. Early gene body mCH accumulation predicts later transcriptional downregulation. (A and B) Normalized gene body mCH (A) and transcript abundance (B) for genes ranked by early mCH accumulation at BAM 5d. Early mCH accumulation is strongly correlated to gene repression in BAM 22d iN cells, and both upregulated and downregulated genes in BAM 13d iN cells. (C) Significance (hypergeometric test) of the enrichment in down- and up- regulated genes for BAM 13d and BAM 22d iN cells. (D and E) Gene body mCH dynamics of static, down- and up- regulated genes with different transcripts abundances - log2(RPKM +1) between 0 and 1 (D), between 4 and 5 (E) during iN cell reprogramming. (F) Gene body mCH level of cerebellum developmentally (P60 vs. P7) regulated genes that were actively expressed (RPKM >3). (G) Alteration of cerebellum gene expression by Nes-Cre;Dnmt3a-/- for developmentally regulated genes. To test whether mCH is associated with a similar effect on dynamic genes during mouse brain development, we analyzed mCH and gene expression in the cerebellum of mice with conditionally ablated de novo DNA methyltransferase Dnmt3a (Dnmt3a fl/fl;Nes-cre) (Frank et al., 2015; Gabel et al., 2015; Hon et al., 2013). Nes-cre;Dnmt3a fl/fl was shown to erase almost all mCH and significantly reduce mCG level in mouse cerebellum, suggesting DNMT3A is the main DNA methyltransferase responsible for developmental de novo methylation in both CH and CG contexts (Gabel et al., 2015). Consistent with our observation in direct reprogramming, mCH level of genes downregulated during cerebellum development (postnatal day 60 vs. day 7) was significantly greater than that of static (Wilcoxon rank sum test, p=1.2×10−81) or upregulated genes (p=0.0123, Figure 2F). Notably, the removal of mCH and reduction of mCG in the Dnmt3a mutant brain did not affect the expression of developmentally static genes, but resulted in an upregulation of developmentally downregulated genes (Figure 2G, p=1.3×10−12), which is consistent with the proposed gene repressive role of mCH. Unexpectedly, Dnmt3a ablation also led to a downregulation of developmentally upregulated genes (p=6×10−15, Figure 2G), suggesting that mC support gene expression at these loci. To understand this observation, we first hypothesize that mC antagonizes polycomb repression at developmentally upregulated genes and indirectly promotes gene expression. However, using H3K27me3 peaks (combined from adult cerebellum and P0 hindbrain) as a marker for polycomb regulation, a comparable fraction (17%, p-value=0.87, fisher-exact test) of developmentally up- and down- regulated genes were regulated by polycomb complex. In addition, for either up- or down- regulated genes, genes overlapping with H3K27me3 peak were not affected differently by Dnmt3a ablation from genes without H3K27me3 (Figure 2—figure supplement 1C). Therefore, these results do not support the model that mC indirectly promote gene expression by antagonizing polycomb repression. We considered a second hypothesis that Dnmt3a indirectly supports developmental gene activation by providing the substrate for hydroxymethylcytosine in a CG dinucleotide context (hmCG). hmCG is associated with actively expressed genes in mouse brain cortex or cerebellum (Lister et al., 2013; Mellén et al., 2017). In support of this speculation, in adult mouse cerebellum, developmentally upregulated genes showed significantly higher level of gene body hmCG than developmentally downregulated genes (p=1.3×10−6, Wilcoxon rank sum test) and static genes (p=2.4×10−55, Wilcoxon rank sum test) (Figure 2—figure supplement 1D). Developmentally upregulated and downregulated genes show comparable levels of other cytosine modifications (mCG, mCH or hmCH). The result suggests that the activation of developmentally upregulated genes is associated with hmCG accumulation, which may indirectly require DNMT3A for contributing the substrate (mCG) for TET methylcytosine dioxygenases to produce hmCG. Next, we wanted to determine the role of mCG dynamics in reprogramming. To examine the interaction between promoter (±500 bp from annotated transcription start sites (TSS)) mCG dynamics and gene expression, we ranked 7427 differentially expressed (FDR < 0.05, Fold change >= 2) genes by fold change between MEF and BAM 22d iN cells. We found a pronounced hyper CG methylation signature at the promoter of genes that become repressed during reprogramming (Figure 3B and C), such as the Col1a2 locus (Figure 3A). Moreover, Col1a2 TSS is heavily methylated in NPC and NPC derived neurons, but not in in vivo grown cells such as fetal cortex or mature cortical neurons (NeuN+) or glia (NeuN-), suggesting direct reprogramming remodeled the methylation state of Col1a2 promoter to that reminiscent in vitro grown neurons (Figure 3A). To compare promoter mCG between direct reprogrammed iN cells, in vitro and in vivo grown cells, we identified 4496 promoters that became significantly hyper CG methylated in BAM 22d iN cells compared to MEFs (Figure 3—figure supplement 1A). Promoters that became hyper CG methylated during direct reprogramming showed significantly greater mCG in BAM 22d iN cells than in in vivo grown cells (p<2.9 × 10−7, Wilcoxon rank sum test, Figure 3—figure supplement 1B), suggesting promoter hyper CG methylation is an epigenomic signature of direct reprogramming. During reprogramming, mCG at promoters showed a strong inverse correlation with gene expression (Figure 3D). This negative correlation between promoter mCG and gene expression in iN cells attenuates rapidly within 2 kb of the TSS, which is strikingly different from primary human or mouse tissues (Figure 3E and Figure 3—figure supplement 1C). Pairwise comparisons of brain cortex to kidney, cerebellum, heart and lung supported the previous analysis of human tissues that the peak negative correlation between mCG and gene expression was found at 2–3 kb downstream of TSS (Figure 3E and Figure 3—figure supplement 1C) (Schultz et al., 2015). Across a broad range gene expression levels, we could identify a subset of genes clearly showing downregulation and promoter hyper CG methylation in BAM 22d iN cells compared to MEF (Figure 3—figure supplement 1D). This subset of genes were also more actively expressed in MEF than in adult mouse cortex (Figure 3F and G). Therefore the downregulation of genes with hyper CG methylated promoter during direct programming is consistent with their repressed expression in in vivo grown neurons. Consistent with their active expressions in MEF, genes with promoter hyper CG methylation induced during reprogramming were strongly enriched in fibroblast specific gene ontology terms such as extracellular matrix or collagen (Figure 3H). Silencing of key non-neuronal programs is associated with promoter hyper CG methylation. (A) Browser view of fibroblast marker gene Col1a2 promoter methylation dynamics and corresponding gene expression during reprogramming. The promoter is strongly methylated throughout NPC differentiation, but is unmethylated in fetal cortex, cortical neurons and glia. However, it gradually accumulates mCG through the course of reprogramming using either Ascl1 alone or BAM factors. (B) Differentially expressed genes between BAM 22d iN and MEF were ranked by their relative fold-changes. (C) mCG change between MEF and BAM 22d in ±20 kb regions surrounding TSS of differentially expressed genes. Hyper CG methylation was found at TSS for downregulated genes. (D) Correlation between mCG change and differential gene expression between BAM 22d iN and MEF in ±5 kb region surrounding TSS. (E) Correlation between mCG change and differential gene expression between brain cortex and kidney in ±5 kb regions surrounding TSS. 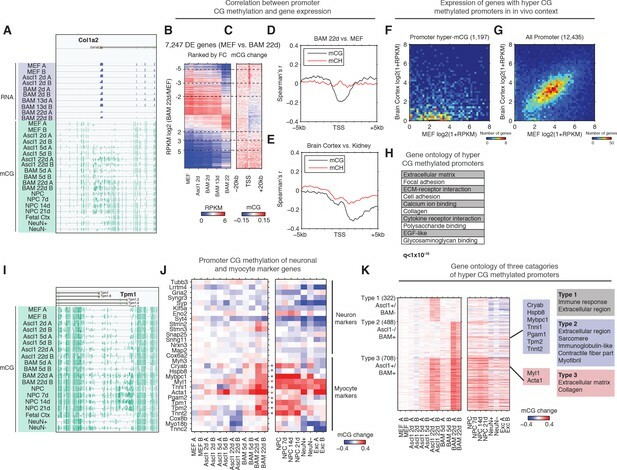 (F–G) Scatter plots comparing the expression of genes with hyper CG methylation promoter in BAM 22d iN cells (F) or all genes (G) between MEF and brain cortex. Hyper CG methylation genes in BAM 22d cells are strongly repressed compared to all genes in the in vivo context. (H) Gene ontology term enrichment of genes with hyper CG methylation promoters in BAM 22d iN cells. (I) Browser view of promoter mCG dynamics of myocyte marker gene Tpm1. The promoter is methylated through NPC differentiation, but is unmethylated in fetal cortex and cortical neurons and glia. However, it remains unmethylated when reprogramming with Ascl1 alone, and only accumulates mCG in the presence of Brn2 and Myt1l in BAM. (J) Promoter mCG dynamics of neuron and myocyte marker genes during reprogramming. Blue asterisks indicate promoters hyper-methylated in BAM 22d iN, but not in Ascl1 22d iN. Red asterisks indicate promoters hyper-methylated in both BAM 22d iN and Ascl1 22d iN. A majority of myocyte genes are only hyper methylated by BAM and not Ascl1 alone. (K) Left: Heatmaps showing promoter mCG during neuronal reprogramming, NPC differentiation and in primary neurons. Promoters were categorized into three groups showing hyper-mCG (mCG increase >0.1) in Ascl1 22d only, BAM 22d only or both type of iN cells. Right: Gene ontology enrichment of promoters for the three groups. Promoters of fibroblast genes were hyper CG methylated in both Ascl1 alone and BAM iN cells, but only BAM 22d cells exhibit strong hyper CG methylation at myogenic genes. We further asked whether the suppression of myogenic program by BAM factors involves the repression of key gene expression by DNA methylation. Indeed, promoters of a significant fraction (8/15) of analyzed myocytic marker genes (Cryab, Hspb8, Mybpc1, Tnni1, Pgam2, Tpm1, Tpm2 and Tnnt2) were hyper-methylated in BAM 22d and NPC derived neurons but not in Ascl1 22d iN (Figure 3I and J) (Treutlein et al., 2016). This result correlates with previous data showing repressed myocyte-specific genes in BAM iN cells (Treutlein et al., 2016). Only a subset of myocytic marker genes (Myl1, Tnni1 and Acta1) were also hyper CG methylated in cortical neurons, suggesting the promoter hyper-methylation at myocytic genes is in part an epigenetic program specific for in vitro grown neurons. We further grouped promoters into three types based on their methylation states in Ascl1 22d or BAM 22d iN cells (Figure 3K). Type two promoters that were specifically hyper CG methylated in BAM 22d cells but not Ascl1 22d, and were enriched in skeletal muscle related function such as sarcomere, contractile fiber part and myofibril (Figure 3K). Remarkably, promoters showing hyper CG methylation during reprogramming were marked with elevated H3K27me3 levels in cortical neurons (p<1.2 × 10−50, rank sum test, Figure 3—figure supplement 1E), suggesting these loci are repressed with polycomb repressive complexes (PRC) in in vivo grown neurons. 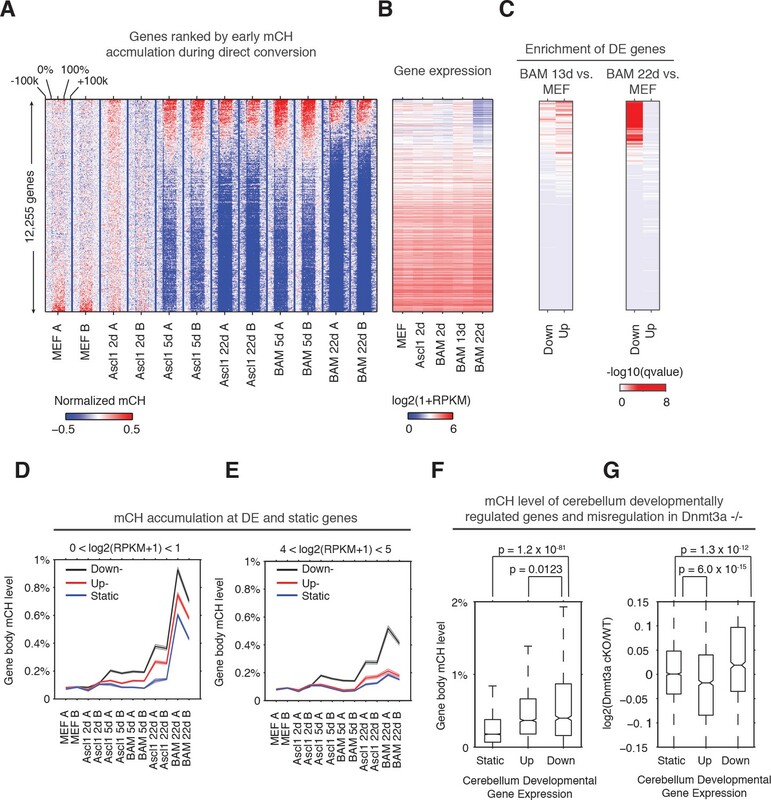 Promoter hyper CG methylation of fibroblast and myocyte specific genes may reflect an alternative repressive mechanism (DNA methylation vs. PRC) being utilized during direct reprogramming or cell culture. Taken together, the suppression of fibroblast and myogenic programs during reprogramming was associated with promoter hyper CG methylation, which indicates the potential role of DNA methylation in mediating the suppression of historical and competing programs during reprogramming. Discrete regions with low levels of DNA methylation have previously been found to indicate TF binding (Mo et al., 2015; Schultz et al., 2015; Stadler et al., 2011). To explore the interaction between CG methylation and TF binding, in particular the binding of ASCL1, BRN2 and MYT1L, we identified 10,075 and 15,093 differentially methylated sites (DMSs) showing reduced mCG during Ascl1-only and BAM induced reprogramming, respectively (Figure 4A and C; Supplementary file 3). 96% of Ascl1-only DMSs and 95.7% of BAM DMSs were located more than 2.5 kb away from the closest TSS. Thus the vastly majority of DMSs are likely to be associated with distal gene regulatory activities. DMSs were grouped based upon their demethylation kinetics (Figure 4A and C). To understand the relationship between DMSs and the binding of TFs that drive the reprogramming of fibroblasts to neurons, we overlapped DMSs and ChIP-seq peaks of ASCL1, BRN2 and MYTL1 requiring a minimum of one base overlap. We compared DMSs with ChIP-seq peaks of ASCL1 following 2 days of overexpression of Ascl1 alone (Ascl1 MEF peaks) or with Brn2 and Myt1l (Ascl1 BAM peaks) in MEF (Figure 4B and D) (Wapinski et al., 2013). Similarly, DMSs were compared to BRN2 peaks following 2 days of overexpression of Brn2 alone (Brn2 MEF peaks), or with Ascl1 and Myt1l (Brn2 BAM peaks) in MEF (Figure 4B and D) (Wapinski et al., 2013). The reduction of local mCG during the reprogramming of fibroblasts to iN cells is likely mediated by direct demethylation instead of passive dilution, since we have previously shown that cells exit cell cycle within 2 days of Ascl1 induction based on significant reduction in Ki67 positive cells (Davila et al., 2013) and homogenous downregulation of cell cycle genes from single cell RNA-seq data (Treutlein et al., 2016). Among the sites that become demethylated in Ascl1-only reprogramming we found a striking co-enrichment of ASCL1 binding, in particular at early demethylating sites (Figure 4B; Figure 4—figure supplement 1C), suggesting that ASCL1 can recruit a DNA demethylation machinery to its target sites. This fits well with Ascl1’s known function as a strong transcriptional activator (Castro et al., 2011; Raposo et al., 2015; Wapinski et al., 2013). Surprisingly, however, only 0.66% (99/15,093) of BAM DMSs were overlapped with ASCL1 peaks (Figure 4D; Figure 4—figure supplement 1C). DMSs demethylated in early stage of BAM induced reprogramming (BAM DMS group 3) are enriched in BRN2 binding sites in MEF (Figure 4D). BAM DMSs demethylated in fully reprogrammed BAM 22d iN cells showed a moderate overlap with BRN2 binding sites in neural stem cells (NSC, Figure 4D). BRN2 binding is known to be dependent on existing open chromatin and pioneer factors such as ASCL1 (Wapinski et al., 2013). This result suggests BRN2 is able to at least partially access its physiological binding sites in fully reprogrammed BAM 22d iN cells. Although Myt1l serves as multi-lineage repressor during reprogramming, we found only 0.3% (38/15,093) BAM DMSs overlapped with MYT1L binding sites (Figure 4—figure supplement 1A–C). Therefore MYT1L binding does not majorly contribute to mCG remodeling during the direct reprogramming. Ascl1 and BAM factors induce distinct CG methylation reconfigurations. (A and C), DMSs identified and combined from all pairwise comparisons during reprogramming driven by Ascl1 alone (A) or BAM (C) were ordered by the kinetics of mCG remodeling (see Materials and methods). The plots show clusters containing more than 100 DMSs, which are statistically more robust. (B and D) Signal intensity of Ascl1 and Brn2 ChIP-seq were plotted for 3 kb regions surrounding the DMSs. (E–H) The overlaps of DMSs identified at different stages of reprogramming driven by Ascl1 or BAM expression. (I) TF binding motif enrichment in DMS groups shown in (A) and (C). Insignificant enrichments (q > 1×10−5) were shown as gray. (J) The distribution of mCG level at Ascl1 peaks during Ascl1-only induced cells during reprogramming. (K) The distribution of mCG level at Ascl1 peaks in BAM induced cells during reprogramming. Consistent with the drastically different representations of ASCL1 binding sites in Ascl1-only DMSs and BAM DMSs, less than 10% DMSs were shared between Ascl1-only and BAM induced reprogramming (Figure 4E and F). In contrast, most DMSs found in Ascl1 5d (89.2%) were also found in Ascl1 22d (Figure 4G), suggesting the little overlap between DMSs demethylated during Ascl1-only and BAM induced reprogramming reflects true biological differences. To further illuminate the nature of the demethylated regions we performed motif enrichment analysis for the surrounding 500 bp (±250 bp) regions of each group of DMSs shown in Figure 4A and C. As expected, the Ascl1 binding motif was strongly enriched in Ascl1-only DMSs (Figure 4I). The DMSs found in the two types of iN cell reprogramming were enriched in completely different TF binding motifs (Figure 4I). Accordingly, the Ascl1 motif was only partly enriched in BAM DMSs demethylated in early reprogramming (BAM DMS group 3), but was depleted in BAM DMSs emerged in later stages of reprogramming (BAM DMS group 1). As expected, the Brn2 (Pou3f2) motif along with several other Pou-Homeodomain motifs were enriched in BAM DMSs but not in any Ascl1-only DMSs. Moreover, we found enrichment of additional motifs of TFs many of which with prominent neuronal function such as Lhx2, Emx2, Nfib and Mef2 in BAM DMSs. These findings indicate that the dynamic DMSs during iN cell reprogramming are enriched in DNA regulatory elements and their proper activation involves DNA demethylation as part of the chromatin remodeling of a fibroblast to a neuronal configuration. Given the striking enrichment of ASCL1 binding at Ascl1-only DMSs, we next analyzed the mCG dynamics of just the Ascl1 binding sites during reprogramming. Although only a moderate 28.4% (935/3296) of Ascl1 binding sites (not already showing lowly methylation in MEF) were overlapped with Ascl1-only DMSs, our quantitative analysis found that Ascl1 expression in fibroblasts induced a substantial reduction of DNA methylation at the vast majority of Ascl1 binding sites in early reprogramming Ascl1 5d with persistence of reduced mCG levels to 22 days (Figure 4J). During BAM-induced reprogramming, the ASCL1-bound sites behaved completely differently. Early in the reprogramming process Ascl1 did induce demethylation at many of its target sites, but to a much more moderate degree (BAM 5d, Figure 4K). Surprisingly, these changes were only transient, as the demethylation of Ascl1 binding sites was reversed in the mature stage of BAM iN reprogramming (BAM 22d). The results suggest that Brn2 and Myt1l functionally interfere with Ascl1-mediated local demethylation. Since ASCL1 chromatin binding is unaffected by other transcription factors (Wapinski et al., 2013), this observation indicates that addition of Brn2 and Myt1l modifies ASCL1’s ability to induce DNA demethylation at its chromatin binding sites and that the two reprogramming strategies are associated with drastically different DNA methylation remodeling (Figure 4J and K). Such modulation of ASCL1 by BRN2 is supported by the co-binding of the two TFs at about about a quarter of ASCL1 sites in MEF (Wapinski et al., 2013). Next, we assessed the expression of known DNA methylation regulators throughout the entire reprogramming process. We found a strong upregulation of the de novo DNA methyltransferase Dnmt3a, the TET methylcytosine dioxygenase 3 (Tet3) involved in DNA demethylation and the mCH reader Mecp2 expressions during reprogramming (Figure 5A) (Chen et al., 2015; Gabel et al., 2015; Guo et al., 2014). The expression of Uhrf1 that encodes a SRA domain protein required for DNMT1-mediated mCG was drastically reduced in BAM 13d and 22d (Figure 5A) (Bostick et al., 2007), suggesting that the maintenance DNA methylation activity became repressed in post-mitotic iN cells. The other DNA methylation regulators were not dynamically regulating during the reprogramming process. Of the regulated genes, we found that ASCL1 directly binds to Dnmt3a promoter. ASCL1 occupies a binding site 1,957 bp downstream of Dnmt3a transcription start site (TSS) in MEF and initial reprogrammed cells (Figure 5B). However, Ascl1 over-expression is insufficient to activate Dnmt3a expression since Dnmt3a was not significantly upregulated 2 days after Ascl1 induction. It remains unclear whether the binding of ASCL1 to the Dnmt3a promoter functionally contributes to Dnmt3a activation during reprogramming. de novo DNA methylation is required for efficient reprogramming from fibroblasts to neurons. (A) Expression of DNA methylation regulators and readers during neuronal reprogramming. (B) Ascl1 ChIP-seq peak is located proximal to Dnmt3a promoter. (C) Immunostaining of Dnmt3a/3bfl/fl cells 14d post-Ascl1 induction with dox. There appears to be a similar reprogramming efficiency when comparing the CreGfp (left) and delCreGfp (right) conditions. However, most TUJ1 +iN cells in the CreGfp condition were still expressing low levels of DNMT3A (white arrows) despite co-infection with CreGfp. (D) Western blot showing efficient knock-out of DNMT3A in Ascl1 +Cre expressing cells compared to Ascl1 +delCre control 13 days post induction of Ascl1. (E) Average counts of TUJ1 +iN cells per 10X field of view 14d post-Ascl1 induction that are co-infected with 1) CreGfp and Dnmt3a- (gray) or 2) delCreGfp and Dnmt3a+ (red) (error bars are stderr, n = 3). To functionally query the role of de novo DNA methylation during reprogramming, we then acutely ablated the two main de novo DNA methylases by co-infecting fibroblasts isolated from Dnmt3a/3bfl/fl mice with lentivirus expressing intact Cre recombinase (Cre) or a non-functional truncated form of Cre recombinase (delCre). To initiate reprogramming we co-infected the cells with a doxycycline (dox)-inducible TetO-Ascl1 lentivirus. Dox was added 2–4 days post-infection to allow for degradation of Dnmt3a mRNA and protein before inducing Ascl1 expression for direct conversion of MEFs to neurons. Dnmt3b is not expressed through the course of reprogramming (Figure 5A). Cells were fixed and immunostained with the neuronal marker TUJ1 and DNMT3A (Figure 5C; Figure 5—figure supplement 1A) 14 days after Ascl1 induction. Despite efficient Dnmt3a depletion in the total fibroblast population (Figure 5D; Figure 5—figure supplement 1C) we observed a number of Dnmt3a-positive iN cells in the Cre-infected group, presumably due to incomplete degradation of Dnmt3a or escape from Cre recombination (Figure 5C; Figure 5—figure supplement 1D–F). We therefore considered only the Dnmt3a-negative iN cells in the Cre-treated group. As shown in Figure 5F, the reprogramming efficiency of Dnmt3a-negative cells (gray) was reduced compared to control-infected, Dnmt3-positive cells (red), indicating that de novo DNA methylation plays a role in efficient iN cell generation from fibroblasts. Our study found that fully reprogrammed iN cells accumulate abundant mCH, which is an epigenomic signature of post-mitotic neurons in the mammalian brain (Guo et al., 2014; Lister et al., 2013). To our knowledge, high level (e.g. mCH/CH > 0.1%) has not been previously reported in any in vitro neuronal differentiation or direct reprogramming models. Robust mCH accumulation suggests that iN cells recapitulates a major epigenomic signature that starts to emerge during the second postnatal week of mouse brain development and supports the notion that fully reprogrammed iN cells resemble differentiated neurons (Lister et al., 2013; Vierbuchen et al., 2010). The observation that BAM induced iN cells further acquired a global mCH landscape reminiscent to mature neurons is consistent with previous findings that BRN2 and MYTL1 can enhance neuronal maturation during reprogramming (Chanda et al., 2014). The reprogramming of fibroblasts to neurons and induction of mCH by overexpressing merely 1 or 3 TFs provides a tractable system to study the dynamic regulation of genome-wide DNA methylation. For example, mCH accumulation during reprogramming is associated with the upregulation of Dnmt3a and may be regulated by the direct binding of ASCL1 to Dnmt3a promoter. In addition, inducible expression of Ascl1 allowed us to conclude that ASCL1 induces local demethylation at most of its binding sites. mCH is inversely correlated with gene expression in the brain and has been shown to mediate gene repression through MECP2 (Chen et al., 2015; Gabel et al., 2015; Lister et al., 2013; Stroud et al., 2017). Although the timing of mCH accumulation parallels neuron maturation both in vivo during in vitro reprogramming, little is known whether mCH plays any role in regulating brain development. Our integrative analysis of transcriptomic and DNA methylome datasets for neuronal reprogramming and published work on cerebellar development shows that mCH is enriched in genes that are downregulated during development (Frank et al., 2015), suggesting that mCH plays a role in gene repression during brain development. Reanalysis of the Dnmt3a conditional knock-out transcriptome data supported our model - developmental downregulated genes become activated in the absence of mCH (Gabel et al., 2015). In both mouse and human, mCH accumulation start around birth and plateaus at early adolescence. Our results collectively suggest that mCH facilitates neuronal maturation during development through gene repression. Direct conversion from fibroblasts to neurons is associated with distinct promoter hypermethylation, which is unique to iN cells and NPC differentiated cells and is not observed during in vivo neuron differentiation. We thus found iN cells exhibit both consistent (e.g. mCH) and different (e.g. promoter methylation) epigenomic features compared to mature cortical neurons. Our study suggests that de novo DNA methylation contributes to cellular reprogramming by suppressing the donor fibroblast and the competing myogenic programs. The promoters targeted by hyper methylation is an independent set from ones bound by multi-lineage suppressor Mylt1l. In summary, our genomic analysis suggests both types of DNA methylation - mCH and mCG serve repressive functions during cellular reprogramming and primarily target gene bodies and promoters, respectively. This hypothesis is supported by our functional experiment showing that fibroblast cells with ablated Dnmt3a locus have reduced reprogramming potential, which supports hypothesis that de novo DNA methylation is necessary for efficient reprogramming. Homozygous TauEGFP knock-in mice were bred with C57BL/6 mice (Jackson Labs) to generate heterozygous embryos (Tucker et al., 2001). The derivation of fibroblast cultures (TauEGF MEFs) was performed by isolating only the limbs from E13.5 embryos, which were then chopped into small pieces, trypsinized for 15 min at 37°C and plated in MEF media, containing 10% cosmic calf serum (Hyclone), 0.008% Beta mercaptoethanol (Sigma), MEM non-essential amino acids, Sodium Pyruvate, and Penicillin/Streptomycin (Pen/Strep) (all from Invitrogen). Neural progenitor cells (TauEGFP NPCs) were derived by harvesting the two cortical lobes from the brain of E12.5 embryos, which are then incubated in N3 media containing DMEM/F12, N2 supplement, Pen/Strep (all from Invitrogen) and 20 ug/ml Insulin (Sigma) at 37°C for 10 min. The cortical tissue was then gently dissociated with a 1 mL micro-pipette, passed through a 0.7 um filter before being plated in N3 media with EGF (20 ng/mL) and FGF (10 ng/mL) onto a cell culture dish that was previously coated with polyornithine (PO) (Sigma P3655) for at least 4 hr followed by laminin (LAM) (Sigma L2020) overnight. For homozygous Dnmt3a/3bfl/fl MEFs, Dnmt3afl/fl and Dnmt3bfl/fl mice on a C57BL/6 background were crossed to generate Dnmt3a/3bfl/fl mice (Challen et al., 2014; Dodge et al., 2005; Kaneda et al., 2004). Whole body MEFs were harvested from E13.5 embryos by removing the head, spinal cord and red organs, minced into small pieces, trypsinized and plated in MEF media on gelatinized flasks to derive fibroblast cultures (Jozefczuk et al., 2012). Both MEFs were expanded for three passages, while NPCs were expanded 3 to 4 passages prior to experiments. Lentivirus was produced, and TauEGFP MEFs were co-infected with reverse tetracyclin transactivator (rtTA) and doxycycline (dox) inducible TetO-Ascl1 alone or with TetO-Brn2 and TetO-Mytl1 as previously described (Marro and Yang, 2014). Dox was added with fresh MEF media 16–20 hr post lentiviral infection, and cultures were switched to N3 +B27 media containing DMEM/F12, N2 and B27 supplements, Pen/Strep (all from Invitrogen) and 20 ug/ml Insulin with dox after 2 days. Cells were harvested at 48 hr, 5d and 22d post-dox induction for MethylC-seq. Control MEFs were not infected and harvested 48 hr after addition of dox. For 5d and 22d, cells were FAC (Fluorescence-activated cell)-sorted for TauEGFP +cells to select for cells that were reprogramming. To ensure that reprogramming efficiencies are comparable, immunofluorescence staining for Tuj1 was performed for each batch of cells at day 14, and only samples that average at least 20 Tuj1 +neurons per 10X field of view were used. In addition for FAC-sorted samples, only samples containing >5% TauEGFP +cells was used. Dnmt3a/3bfl/fl MEFs were co-infected with rtTA, TetO-Ascl1 and either CreGFP or delCreGFP (both with constitutive FUW promoters). DelCreGFP contains a truncated and non-functional version of Cre and was used as a control. Fresh MEF media was added 16–20 hr after infection. Dox was then added between 2–4 days later to allow knockout of the Dnmt3a/b locus by Cre and degradation of the remaining protein before reprogramming with Ascl1. P3-4 NPCs were seeded into cell culture plates that were previously coated with PO + LAM in N3 +EGF + FGF media. After one day, the media was replaced with fresh differentiation media containing N2 +B27 media, without EGF and FGF. Half media replacement with fresh N2 +B27 media was performed every alternate day. Control NPCs were harvested for MethylC-seq 2 days after seeding (without addition of differentiation media). Differentiating cells were harvested for MethylC-seq at 7d, 14d and 21d after addition of differentiation media and were FAC-sorted for TauEGFP +cells to select for neuronal cells. DNA extraction was performed using the Qiagen DNeasy Blood and Tissue kit (#69506) with some modifications to the protocol. Fresh cells were washed once with PBS, then re-suspended in 900 uL ATL, 100 uL Proteinase K, 20 uL of RNAse A (Invitrogen 12091021) and 200 uL AL. Cell suspension is then incubated at 56°C for 10 min. Then 1 mL of 100% Ethanol is added and mixture was briefly vortexed before loading onto a spin-column. DNA is then washed on the column following Qiagen’s protocol and finally eluted into 50–100 uL AE. Cells were fixed and counted as previously described (Wapinski et al., 2017). Briefly, cells were fixed with 4% paraformaldehyde at 14d post-dox, blocked with 5% cosmic calf serum (CCS), incubated with primary antibodies for at least an hour, followed by secondary antibodies for at least half an hour. Ten 10X images were then taken per biological replicate (MEFs derived from different embryos), and the relevant cells were counted. Tuj1 +neuronal cells were counted manually, and only cells with neurite extensions that are at least three times the length of the cell body diameter are included in the counts. ImageJ was used for counting DAPI, Dnmt3a + and Cre/delCreGfp + cells (Schneider et al., 2012). A threshold was first set to eliminate background noise and kept consistent for all images within a single biological replicate. Then ‘Watershed’ was ran to distinguish distinct nuclei, and ‘Analyze particles’ was used (size = 0.01 Infinity) to count the number of cells. For each replicate, the number of cells per 10X view was taken as an average of all the images taken. Rabbit anti-Tubb3 (Tuj1, Covance MRB-435P), rabbit anti-Dnmt3a (H-295, Santa Cruz Biotech sc-20703), chicken anti-GFP (Abcam ab13970), rabbit anti-HSP90 (cell signaling 4874), rabbit anti-H3 (cell signaling 9712). Secondary Alexa-conjugated antibodies were used at 1:1000 (all from Invitrogen). MethylC-seq libraries were prepared as previously described (Urich et al., 2015), except regular lambda DNA (Promega cat. # D1501) isolated from dcm +E.Coli was spiked into samples as the control for non-conversion rate. MethylC-seq libraries were sequenced on Illumina HiSeq 2500. Non-conversion rate was computed from each sample after excluding CAG and CTG trinucleotides from lambda DNA sequence. MethylC-seq reads were mapped to mm9 reference genome using MethylPy (https://bitbucket.org/schultzmattd/methylpy/wiki/Home) (Lister et al., 2013; Ma et al., 2014). To ensure the correct calling of mCG and mCH, we removed cytosine positions with potential single nucleotide variants located at cytosines or immediately downstream of cytosines as previously described (Luo et al., 2016). To compare the methylome of iN cells to primary neurons and other mouse tissues, methylome reads of NeuN +neurons (GSM1173786), NeuN- glia (GSM1173787), Camk2a + excitatory neurons (GSM1541958 and GSM1541959), cortex (GSM1051153), cerebellum (GSM1051151), olfactory bulb (GSM1051159), heart (GSM1051154), kidney (GSM1051156), lung (GSM1051158) and pancreas (GSM1051160) were downloaded from NCBI SRA and processed identically as iN cell methylome data. BAM DMSs were similarly identified, combined and grouped between MEF and all BAM iN cell samples. Ascl1 and Brn2 ChIP-seq dataset for iN cell samples were previously published in GSE43916 (Wapinski et al., 2013) - Ascl1 MEF (SRR935631, SRR935632), Ascl1 BAM (SRR935633, SRR935635, SRR935634), Brn2 MEF (SRR935643, SRR935644), Brn2 BAM (SRR935645, SRR935646), Brn2 NSC (SRR935647, SRR935648). H3K27me3 ChIP-seq peaks for adult mouse cerebellum and P0 mouse hindbrain were downloaded from ENCODE accession ENCFF112CIF and ENCFF953WTE, respectively, and converted to mm9 coordinates. Sequencing reads were mapped to mm9 reference genome using bowtie2 2.1.0 (Langmead and Salzberg, 2012). ChIP-seq peaks were identified using MACS2 2.0.10 with q value < 0.01. Peaks called from the two replicates of Brn2 BAM ChIP-seq were combined. To analyze DNA demethylation induced by TF bindings, Ascl1 and Brn2 peaks that overlapped with lowly methylate regions (UMRs or LMRs) identified from Ascl1 2d methylome were removed. UMRs and LMRs were identified using MethylSeekR with m = 0.5% and 5% FDR (Burger et al., 2013). For all reprocessing of published RNA-seq data, RNA-seq reads were downloaded from NCBI SRA and mapped to mm9 Refseq gene annotation using STAR 2.4.0 (Dobin et al., 2013). Mapped RNA-seq reads were counted and summarized to the gene level with HTSeq 0.6.1 followed by normalization and computation of RPKM using edgeR 3.8.6 (Anders et al., 2015; Robinson et al., 2010). Differentially expressed genes were identified using edgeR 3.8.6 with FDR < 0.05 and Fold Change >= 2 (Robinson et al., 2010). RNA-seq dataset of iN cell reprogramming was downloaded from GSE43916 (Wapinski et al., 2013). Single cell gene expression dataset of iN cell reprogramming was previously published (Treutlein et al., 2016). Mouse tissue RNA-seq dataset was downloaded from NCBI GEO accessions cerebellum (GSM723768), cortex (GSM723769), heart (GSM723770), kidney (GSM723771), lung (GSM723773) and olfactory bulb (GSM850911) (Shen et al., 2012). Cerebellum developmental RNA-seq dataset was downloaded from NCBI SRA accessions P7 (SRR1557065, SRR1557066, SRR1557067), P14 (SRR1557068, SRR1557069, SRR1557070) and P60 (SRR1557071, SRR1557072, SRR1557073). Dnmt3a -/-;Nes-cre gene expression dataset was downloaded from NCBI GEO accessions WT (GSM1464557, GSM1464558, GSM1464559) and Dnmt3a KO (GSM1464560, GSM1464561, GSM1464562). TF binding position weight matrices (PWM) were obtained from the MEME motif database and scanned across the mouse mm9 reference genome to identify hits using FIMO (--output-pthresh 1E-5, -- max-stored-scores 500000 and --max-strand) (Bailey et al., 2009; Grant et al., 2011). DMSs were extended 250 bp both upstream and downstream for overlapping with TF binding motif hits. The overlap between TF binding motif hits and DMSs (extended ±250 bp) were determined requiring a minimal of 1 bp overlap. The enrichment of TF binding motifs in DMSs was assessed using DMRs (extended 250 bp from center) identified across adult mouse tissues (tissue DMRs) as the background (Hon et al., 2013). The overlaps between TF binding motif hits and iN cell DMS categories (foreground) was compared to the overlaps between TF binding motifs hits and tissue DMRs (background) using the hypergeometric test (MATLAB hygecdf). A TF binding motif is considered significantly enriched or depleted if the hypergeometric test resulted in q value < 1E-5. MethylC-seq data files were deposited to NCBI GEO accession GSE111283. Methylome profiles are visualized using an AnnoJ browser at http://neomorph.salk.edu/iN_transdifferentiation.php. Journal of Neuroscience Methods 216:104–109. Journal of Biological Chemistry 280:17986–17991. Journal of Visualized Experiments, 10.3791/3854, 22760161. Methods in Molecular Biology 1150:237–246. Proceedings of the National Academy of Sciences 114:E7812–E7821. Thank you for submitting your article "Global DNA methylation remodeling during direct reprogramming of fibroblasts to neurons" for consideration by eLife. Your article has been reviewed by two peer reviewers, and the evaluation has been overseen by a Reviewing and Jessica Tyler as the Senior Editor. The reviewers have opted to remain anonymous. 1) Figure 2G demonstrates a down-regulation of developmentally up-regulated genes in Dnmt3a KO cerebellum. Can the authors speculate on why the ablation of a de novo DNA methylase leads to down-regulation of normally up-regulated genes – i.e. indirect effect? 2) In regards to Figure 4 the authors speculate that ASCL1 can recruit demethylation machinery as it is frequently found at DMSs that lose methylation early in Ascl1-only reprogramming. Could the authors indicate whether this loss may also occur through passive dilution/lack of recruitment of the maintenance methylase? 3) Figure 5B shows Ascl1 at the promoter of Dnmt3a by ChIP – is there any data that Ascl1 binding induces Dnmt3a expression? Knockdown/knockout of Ascl1 affecting Dnmt3a expression levels for example? 4) In Figure 5C the large population of Dnmt3a positive cells that remain despite Dox treatment seems to suggest these cells may be selected for in the process of reprogramming. The Cre recombinase strategy is certainly not 100% efficient, but seems to work very well in this system according to Figure 5D. Could the authors provide some explanation for why this population is "a large fraction"? 5) The authors state "We identified a large number (2,098, Cluster 15 and 16) of genes that were clearly hypermethylated in MEFs, and immature iN cells but were strongly depleted of mCH in BAM 22d iN cells (box in Figure 1C)". I suggest a revision of the statement here because, according to the key for normalized mCH values, hypermethylation corresponds to red and genes in cluster 15 and 16 in MEFs show instead medium levels of methylation (pale blue). In the text: "Through correlating with transcriptome analysis of iN cell reprogramming, we found that genes in Cluster 15 and 16 were actively expressed in successfully reprogrammed iN cells (Figure 1E and Figure 1—figure supplement 1E) (Treutlein et al., 2016)" Figure —figure supplement 1E is missing. 6) The authors ranked genes by gene body mCH levels in BAM 5d. The authors state "Notably, genes with early mCH accumulation showed strongly reduced expression in the late stage of neuronal reprogramming (BAM 22d, Figure 2B-C)." I suggest a careful consideration with this statement since, looking at Figure 2A-C, one could also say that early accumulation of mCH can predict later transcriptional expression/up-regulation. For example, looking at BAM 13d, early mCH accumulation (BAM 5d) would correlate first with gene activation at BAM 13d, then with strongly reduced expression at BAM 22d. This type of correlative analysis would be more appropriate having gene expression data from BAM 5d and BAM 22d and even better by performing RNA/DNA parallel purification from the same sample and then generating the data sets. Same for where the authors state in the figure legend to Figure 2 "Early mCH accumulation is strongly correlated to later gene repression". 7) The authors state "Surprisingly, we found different patterns depending on the fold-change of gene expression: Mildly up-regulated genes accumulated intermediate mCH levels between down-regulated and static genes whereas strongly up-regulated genes and static genes were close to the MEF baseline of mCH levels (Figure 2D, E). These results suggest a model that mCH is preferentially targeted to mildly dynamic genes and modulates their expression during reprogramming, for strongly differentially regulated genes, however, mCH is mostly accumulating at down-regulated genes." I suggest to clarify with more information the reference points used to determine differential gene expression to create the categories Down, Up, Static. It is not clear if the differential gene expression is between BAM 2d and BAM22d. Considering the data from Gabel et al., 2015 normalizing to gene size in the analysis of Figure 2D, E may be relevant since a longer gene could accumulate more mCH in association with gene repression. 8) In the sentence "To explore the interaction between CG methylation and TF binding, in particular the binding of ASCL1, BRN2 and MYT1L, we identified 10,075 and 15,093 differentially methylated sites (DMSs) showing reduced mCG during Ascl1-only and BAM induced reprogramming, respectively (Figure 4A, C and Supplementary file 3)." 1) The numbers of DMSs 10,075 and 15,093, don't match the numbers that are summed up from the groups in the Figure 4A, C. 2) In the figure legend the information about which pair of iN cells were compared in the determination of DMSs is missing. For Ascl1-only, is it 22d vs. 2d? And for BAM-only, 22d vs. 5d? Finally, for those exact locations, were mCG estimations for 5d and MEF plotted? 3) "only 0.6% (99/15,093) BAM DMSs were overlapped with ASCL1 peaks (Figure 4D)". I suggest to verify if the percentage indicated here is correct. 9) In the sentence "Among the sites that become demethylated in Ascl1-only reprogramming we found a striking co-enrichment of ASCL1 binding, in particular at early demethylating sites (Figure 4B and Figure 4—figure supplement 1C)". The ChIP-seq data for Ascl1 in MEFs show Ascl1 binding in MEFs preceding direct reprogramming, which is surprising. Same as the ChIP-seq data for BRN2 that show binding in MEFs preceding direct reprogramming. I suggest to add a brief sentence to justify this observation based on prior data, so to clarify the result. 10) "we found only 0.3% (38/15,093) BAM DMSs overlapped with MYT1L binding sites" I suggest to verify if the percentage indicated here is correct. The DMSs reported in the Supplementary file 3A, B are specific CG sites 1bp. It would help to understand the data if the authors could elaborate on how the overlapping analysis was done: given the information provided, it seems that between the genomic coordinates of ChIP-seq peaks and the genomic coordinates of a specific CG site differentially methylated. Same for the motif enrichment analysis: I would add a brief sentence explaining how it was done because in the text the authors mention regions "To further illuminate the nature of the demethylating regions" Are these UMR/LMRs? 11) The authors state "Our results collectively suggest that mCH facilitates neuronal maturation during development through gene expression". Is it through gene expression or gene repression here? 12) Optional: In Figure 1B it would be good to include the cortex MethylC-seq data from Hon et al., 2013 in order to examine if BAM 22d iN cells also cluster closely to cortex tissue. This work seeks to identify the genome-wide changes in DNA methylation that occur during the process of direct reprogramming of fibroblasts to induced neurons. In doing so the group examines two reprogramming strategies that are composed of either expressing a neuron-inducing transcription factor (Ascl1) or expressing the inducing transcription factor in combination with two other transcription factors that repress a myogenic state. They compare the DNA methylation status of these two strategies not only to each other but also to mature in vivo neurons in order to demonstrate the capacity of reprogramming to faithfully exhibit molecular markers of the intended cell types. These comparisons allow for an in vitro examination of the role that these transcription factors may also have in vivo neuronal development. Additionally, on a mechanistic level the authors indicate that the progressive increase in DNA methylation is due in large part to the increased expression of one of the de novo methylases – Dnmt3a. The major contribution of this work is a detailed description of the DNA methylation status in induced neurons as well as a convincing demonstration of how DNA methylation levels in reprogrammed cells mostly reflect the methylation status of mature neurons in a mouse brain. This has not been sufficiently demonstrated previously. The authors demonstrate how a cellular reprogramming system may indicate which epigenetic marks are important to in vivo development and differentiation such as mCH DNA methylation in neuronal development in this case. 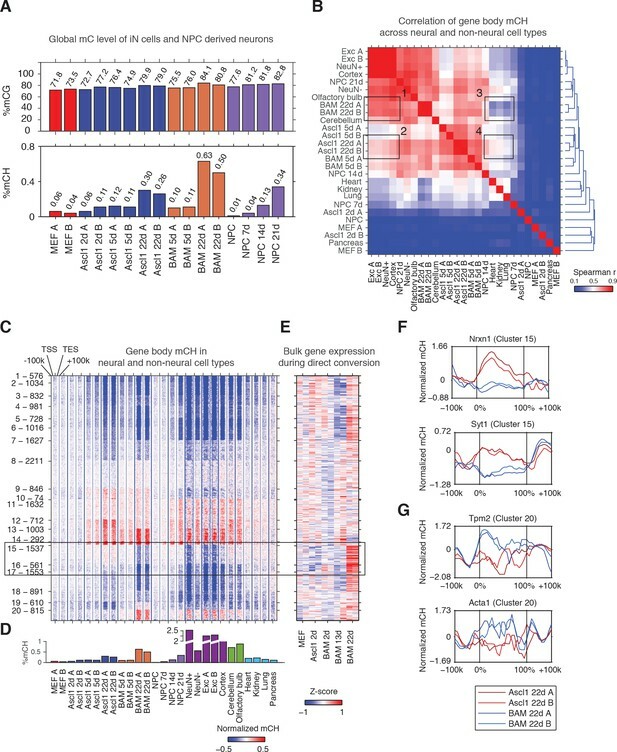 Furthermore, the authors show that reprogramming with the three transcription factors (BAM) more accurately recapitulates the gene expression and methylation levels of mature neurons as opposed to reprogramming with Ascl1 alone indicating that reprogramming is aided by the repression of alternative states via epigenetic regulation. In the current manuscript entitled "Global DNA methylation remodelling during direct reprogramming of fibroblasts to neurons" Luo & Lee et al., generate whole-genome base-resolution methylomes by MethylC-seq to characterize the global reconfiguration of the DNA methylome through the induction of a neuronal phenotype (iN) in mouse embryonic fibroblast using a lineage instructive approach, ectopically expressing the pioneer transcription factor Ascl1 alone or in combination with Brn2 and Mytl1. 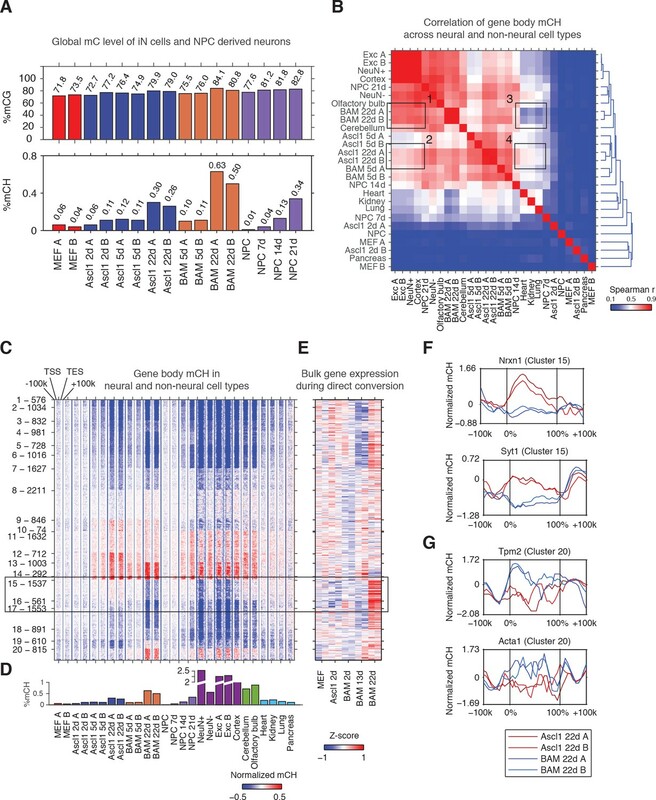 They show that the two reprograming strategies led to considerably different DNA methylation remodelling, with BAM factors producing a pattern that is more comparable to mature cortical neurons than Ascl1 alone. These factors are required, yet not sufficient, to acquire the DNA methylome of mature cortical neurons observed during in vivo neuron differentiation, acknowledging consistencies and differences between iN cells and mature neurons. The authors have strong expertise in the fields of trans differentiation, particularly with the induction of fibroblasts to neurons by employing a defined set of transcription factors, such as Ascl1, Brn2 and Mytl1, whose ectopic expression in fibroblasts has been previously shown to induce a functional neuronal phenotype by these and other groups. An exciting part of the work is the interrogation of the contribution of these TF to the reconfiguration of the DNA methylome. The authors show the accumulation of mCH in iN cells, an epigenomic signature of neuronal differentiation and of mature cortical neurons, in association with gene down-regulation and also examine mCG dynamics during conversion, an aspect not examined until this work on iN cells. Interestingly, the acquisition of mCG associates with the suppression of fibroblast and myogenic programs and conditional ablation of Dnmt3a reduces the efficiency of iN cells generation from fibroblast, indicating that de novo methylation is required for efficient direct conversion to iN cells. The paper is well-written, the methods fit with the aims of the study with a clearly described approach, the results are well-articulated and the conclusions are appropriate, given the results. I am overall enthusiastic about the work presented by the authors as no pre-existing study has been published addressing the reprograming of the DNA methylome upon direct conversion of fibroblasts to neurons. There are minor concerns and details missing about the data analysis not entirely clear that the authors ought to address. Despite these concerns, I believe that this manuscript meets the publication criteria for ELife. The authors state "We identified a large number (2,098, Cluster 15 and 16) of genes that were clearly hypermethylated in MEFs, and immature iN cells but were strongly depleted of mCH in BAM 22d iN cells (box in Figure 1C)". I suggest a revision of the statement here because, according to the key for normalized mCH values, hypermethylation corresponds to red and genes in cluster 15 and 16 in MEFs show instead medium levels of methylation (pale blue). In the text: "Through correlating with transcriptome analysis of iN cell reprogramming, we found that genes in Cluster 15 and 16 were actively expressed in successfully reprogrammed iN cells (Figure 1E and Figure 1—figure supplement 1E) (Treutlein et al., 2016)" Figure 1—figure supplement 1E is missing. The authors ranked genes by gene body mCH levels in BAM 5d. The authors state "Notably, genes with early mCH accumulation showed strongly reduced expression in the late stage of neuronal reprogramming (BAM 22d, Figure 2B-C)." I suggest a careful consideration with this statement since, looking at Figure 2a-c, one could also say that early accumulation of mCH can predict later transcriptional expression/up-regulation. For example, looking at BAM 13d, early mCH accumulation (BAM 5d) would correlate first with gene activation at BAM 13d, then with strongly reduced expression at BAM 22d. This type of correlative analysis would be more appropriate having gene expression data from BAM 5d and BAM 22d and even better by performing RNA/DNA parallel purification from the same sample and then generating the data sets. Same for where the authors state in the figure legend to Figure 2 "Early mCH accumulation is strongly correlated to later gene repression". The authors state "Surprisingly, we found different patterns depending on the fold-change of gene expression: Mildly up-regulated genes accumulated intermediate mCH levels between down-regulated and static genes whereas strongly up-regulated genes and static genes were close to the MEF baseline of mCH levels (Figure 2D, E). These results suggest a model that mCH is preferentially targeted to mildly dynamic genes and modulates their expression during reprogramming, for strongly differentially regulated genes, however, mCH is mostly accumulating at down-regulated genes." I suggest to clarify with more information the reference points used to determine differential gene expression to create the categories Down, Up, Static. It is not clear if the differential gene expression is between BAM 2d and BAM22d. Considering the data from Gabel et al., 2015 normalizing to gene size in the analysis of Figure 2D, E may be relevant since a longer gene could accumulate more mCH in association with gene repression. In the sentence "To explore the interaction between CG methylation and TF binding, in particular the binding of ASCL1, BRN2 and MYT1L, we identified 10,075 and 15,093 differentially methylated sites (DMSs) showing reduced mCG during Ascl1-only and BAM induced reprogramming, respectively (Figure 4A, C and Supplementary file 3).” 1) The numbers of DMSs 10,075 and 15,093, don't match the numbers that are summed up from the groups in the Figure 4A, C. 2) In the figure legend the information about which pair of iN cells were compared in the determination of DMSs is missing. For Ascl1-only, is it 22d vs. 2d? And for BAM-only, 22d vs. 5d? Finally, for those exact locations, were mCG estimations for 5d and MEF plotted? 3) "only 0.6% (99/15,093) BAM DMSs were overlapped with ASCL1 peaks (Figure 4D)" I suggest to verify if the percentage indicated here is correct. In the sentence "Among the sites that become demethylated in Ascl1-only reprogramming we found a striking co-enrichment of ASCL1 binding, in particular at early demethylating sites (Figure 4B and Figure 4—figure supplement 1C)". The ChIP-seq data for Ascl1 in MEFs show Ascl1 binding in MEFs preceding direct reprogramming, which is surprising. Same as the ChIP-seq data for BRN2 that show binding in MEFs preceding direct reprogramming. I suggest to add a brief sentence to justify this observation based on prior data, so to clarify the result. "we found only 0.3% (38/15,093) BAM DMSs overlapped with MYT1L binding sites" I suggest to verify if the percentage indicated here is correct. The DMSs reported in the Supplementary file 3A, B are specific CG sites 1bp. It would help to understand the data if the authors could elaborate on how the overlapping analysis was done: given the information provided, it seems that between the genomic coordinates of ChIP-seq peaks and the genomic coordinates of a specific CG site differentially methylated. Same for the motif enrichment analysis: I would add a brief sentence explaining how it was done because in the text the authors mention regions "To further illuminate the nature of the demethylating regions" Are these UMR/LMRs? The authors state "Our results collectively suggest that mCH facilitates neuronal maturation during development through gene expression". Is it through gene expression or gene repression here? Optional: In Figure 1B it would be good to include the cortex MethylC-seq data from Hon et al., 2013 in order to examine if BAM 22d iN cells also cluster closely to cortex tissue. We agree with the reviewer that it is intriguing that the ablation of Dnmt3a leads to downregulation of developmentally upregulated genes. Given the role of mC as a repressive epigenetic mark, it seems to be paradoxical that the major de novo DNA methyltransferase DNMT3A is required for supporting gene expression. We considered two hypotheses that may explain why mC mediated by DNMT3A can contribute positively to transcription. 1) DNMT3A mediated mC antagonizes polycomb repression at certain loci and is associated with active gene expression. To test this hypothesis, we first asked whether developmentally upregulated genes are more likely to be targeted by polycomb repressive complex, using H3K27me3 as a marker for polycomb regulation. However, we found that a comparable fraction (17%, p-value = 0.87, fisher-exact test) of developmentally up- and down- regulated genes were regulated by polycomb complex. Secondly, we asked whether developmentally upregulated genes associated with H3K27me3 peaks are more strongly down-regulated upon the ablation of Dnmt3a, compared to genes that do not overlap with H3K27me3. However, for either developmentally up- or down- regulated genes, genes enriched in H3K27me3 do not show significantly different mis-regulation compared to genes without H3K27me3 enrichment. Together, our results suggest that the observed positive correlation between mC and gene expression was not majorly contributed by the antagonism between mC and polycomb repression. This analysis is included in the revised manuscript as Figure 2—figure supplement 1C. This analysis have been incorporated into the revised manuscript. 2) DNMT3A indirectly support gene expression by contributing to the accumulation of hydroxymethylcytosine in CG dinucleotide context (hmCG). Cerebellar neurons accumulate a high level of hmCG, which is associated with active gene expression. It was recently shown that hmCG cannot interact with MECP2 (Gabel et al., 2015; Mellén et al., 2017). Thus the oxidation of mCG abolishes its repressive function. We speculate that DNMT3A, through catalyzing de novo mCG, provides the necessary substrate for TET methylcytosine dioxygenase to produce hmCG. To ask whether the accumulation of hmCG is involved in gene activation during development, we compared different cytosine modifications between developmentally up- and down- genes using an oxBS-seq dataset generated from cerebellar granule cells (Mellén et al., 2017). Interestingly, developmentally up-regulated genes showed significantly higher level of gene body hmCG, but not other types of cytosine methylation, than developmentally down-regulated genes (p = 1.3 x 10-6, Wilcoxon rank sum test) and static genes (p = 2.4 x 10-55, Wilcoxon rank sum test). Thus, DNMT3A could indirectly support gene expression by mechanistically contribute to gene body hmCG. We have previously shown that cells exit the cell cycle within 2 days of Ascl1 induction based on significant reduction in Ki67 positive cells (Davila et al., 2013) and homogenous downregulation of cell cycle genes from single cell RNA-seq data (Treutlein et al., 2016). Thus, the observed reduction of mCG at ASCL1 binding site is likely mediated by direct demethylation instead of passive dilution. We have included this discussion in the revised manuscript. We agree with the reviewer that the original manuscript did not present evidence to support the functional regulation of Dnmt3a by ASCL1 binding. After examining published data from both mouse and human that are obtained from knock-down or over-expression of Ascl1, we cannot conclusively determine whether Ascl1 functionally regulates Dnmt3a expression. 1) Dnmt3a expression is not significantly different between MEF and MEF cells over-expressing Ascl1 for 2 days (fold change = 1.38, p-value = 0.28, t-test). 2) ASCL1 down regulation in human U87MG glioma cell line does not induce Dnmt3a mis-regulation (fold change = 1.07, p-value = 0.25, t-test, GSE76652) (Donakonda et al., 2017). 3) Ascl1 knock-out in human glioblastoma stem cells does not alter Dnmt3a expression (fold change = 1.13, p-value = 0.1, t-test, GSE87615) (Park et al., 2017). 4) Ascl1 over-expression in Ascl1 knock-out human glioblastoma stem cell line leads to down-regulation of Dnmt3a (fold change = 0.81, p-value = 0.006, GSE87617) (Park et al., 2017). We have revised the manuscript to clearly indicate that this remains an open question. We thank the reviewer for noticing this oversight. Figure 1—figure supplement 1D instead of Figure 1—figure supplement 1E should be referenced here. This error has been corrected in the revised manuscript. 7) The authors state "Surprisingly, we found different patterns depending on the fold-change of gene expression: Mildly up-regulated genes accumulated intermediate mCH levels between down-regulated and static genes whereas strongly up-regulated genes and static genes were close to the MEF baseline of mCH levels (Figure 2D, E). These results suggest a model that mCH is preferentially targeted to mildly dynamic genes and modulates their expression during reprogramming, for strongly differentially regulated genes, however, mCH is mostly accumulating at down-regulated genes." I suggest to clarify with more information the reference points used to determine differential gene expression to create the categories Down, Up, Static. It is not clear if the differential gene expression is between BAM 2d and BAM22d. Considering the data from Gabel et al., 2015 normalizing to gene size in the analysis of Figure 2D, E may be relevant since a longer gene could accumulate more mCH in association with gene repression. The reviewer has raised an interesting point that gene body mCH accumulation may be related to gene length as described in Gabel et al., 2015. In the revised manuscript, we have compared the relation between gene length and gene body mCH level in both mouse cortex and iN cells (Figure 1—figure supplement 1E and F). Compared to mouse cortex, fully reprogrammed iN cells (BAM 22d) show a less pronounced mCH accumulation in long genes. We apologize for the confusion caused by the inconsistent DMS numbers in the text and figure. We excluded small DMS clusters including those less than 100 DMS, which likely reflect noise generated by setting of statistical thresholds. We have now clearly indicated this in the legend of Figure 4. DMSs described in Figure 4 were identified and combined from all pairwise comparisons, followed by grouping by the kinetics of mCG remodeling. We have revised the legend of Figure 4 to include this information. We have validated the accuracy of the number of overlaps between BAM DMSs and ASCL1 peaks. The revised manuscript now shows a more accurate percentage. We agree with the reviewer that adding more details of our previous study (Wapinski et al., 2013) would improve the clarity of the results. Ascl1 MEF and Brn2 MEF ChIP-seq data were generated by over-expressing Ascl1 or Brn2 individually in MEF cells for two days before the ChIP assays were performed. We have verified the accuracy of the overlap between BAM DMSs and MYTL1 ChIP-seq peaks. We thank the reviewer for noticing this error. We have corrected the error in the revised manuscript. As suggested by the reviewer, a cortex sample from Hon et al., 2013 has been added to the analyses in Figure 1B-D. As expected, BAM 22d iN cells show overall similar mCH pattern as the cortex sample. The work is supported by NIH P50-HG007735 (HYC), CIRM RB5-07466 (HYC, MW) and NIH R01 DK092883 (MAG). JRE and HYC are Howard Hughes Medical Institute investigators. © 2019, Luo et al.